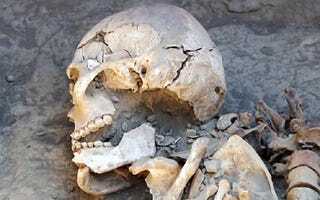 Archaeologists working in Kazakhstan have uncovered the remains of an ancient female warrior who lived sometime between the 11th century BC and 4th century AD. Researchers from Russia’s Institute of Archaeology identified the remains as female by analyzing the shape and size of the skull. Other graves of warrior women have previously been found in the Eurasian Steppe, but this is the first one discovered in Kazakhstan. As reported in News.com.au, she is believed to be a member of the Sarmatian people who lived north of the Black Sea in the state of Kangyuy from 500 BC to 400 AD. These nomads controlled a critical corridor of the Silk Road trade route connecting Europe and China. A large sword was laid next to her left hand, while the dagger was positioned near her right hand. Other remains, including ancient arrows and finely crafted pots and bowls, suggest she was a woman of wealth and importance. The items are set to go on display at the National Museum of Kazakhstan. Email the author at george@io9.com and follow him at @dvorsky. Top image by EuroPics/Institute of Archaeology.